PRAGUE PUBLIC TRANSPORT infrastructure consists of an intensely used integrated transport system of Prague Metro (its length is 59 km with 57 stations in total), Prague Tram System (including the „nostalgic tram“ no. 91), Prague Bus System, the Petřín funicular to Petřín Hill, and six ferries: PID, Pražská integrovaná doprava (Prague integrated transport system). Prague has one of the highest rates of public transport usage in the world with 1.2 billion passenger journeys per annum. Per capita usage of the Prague metro is the highest in the world. According to its builder, the escalator at Náměstí Míru station is the longest escalator in Europe. In Prague there are also three cable cars. The first is the on Petrin Hill and the other is on the hill Mrázovka and the third is at the ZOO in Troja. The Metro has three major lines extending throughout the city; in June 2010, construction began to extend the green line further into the northwest corner of Prague and eventually to the airport. A fourth Metro line is planned, although a date for construction to begin has not yet been specified. Although Melbourne, Australia has the longest total tram system length in the world, Prague's tram network is one of the largest in the world by other measures. The Prague tram rolling stock consists of over 900 individual cars, of those around 700 are the T3 class, which are typically operated coupled together in pairs. The system carries more than 356 million passengers annually, the third highest tram patronage in the world after St Petersburg and Budapest. On a per capita basis, Prague has the second highest tram patronage after Zurich. All services have a common ticketing system, and are run by the Prague Public Transport Company (Dopravní podnik hl. m. Prahy, a. s.) and several other companies. Recently, the Regional Organiser of Prague Integrated Transport (ROPID) has franchised operation of ferries on the Vltava river, which are also a part of the public transport system with common fares. Taxi services operate from regulated taxi stands, and from independent drivers who make pick-ups on the street. Prague public transport: Tourist and practical information about Prague public transport. 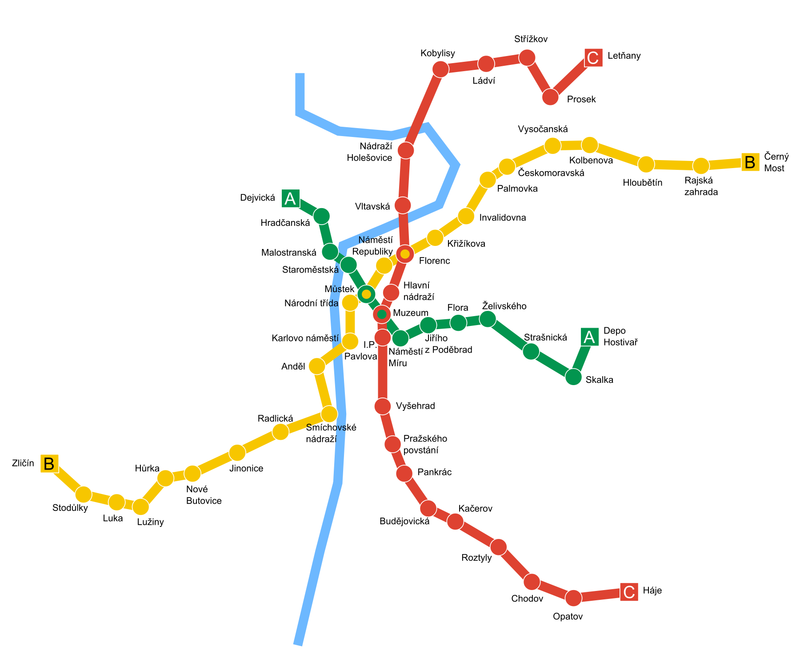 Prague metro, trams, buses and more.